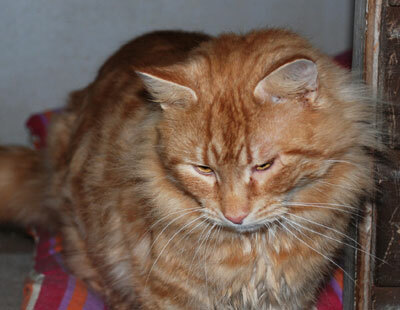 who had been at the Sanctuary for over 4 months, has now gone to a new home. A very big thank you goes to Lynn Flanders of Wormit for giving up her Saturday to fetch a lovely disabled lady from St Andrews to Whinnybank – the lady chose a pair of 10 year old cats & Lynn took the happy family back home again. Sue did Tayport on Sunday – it was a lovely day but there were a lot of people selling so we didn’t take a great deal of money. Thanks to Mairi Brady, our kitten fosterer from the Bridge of Earn, who arrived with lots of home-made cakes which quickly sold out! Many thanks to all the people handing in plums – we can always use more! !